Looking for an affordable restaurant with a water view? South Florida has plenty of scenic waterfront Miami restaurants that won’t break the bank. Miami is one of the few cities where you can relax and enjoy a gorgeous ocean, bay or intercoastal view while dining. 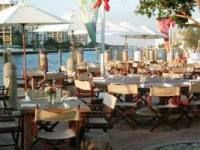 Miami Beach restaurants guide brings to you our top four waterfront Miami restaurants that serve up fresh air, cool waves and good food at an affordable price. Located on the Miami River and just a few blocks from downtown Miami, Garcia's is a local’s favorite waterfront Miami restaurants. The casual seafood restaurant sits on the edge of the river and is packed seven days a week. Diners can enjoy stone crabs or mahi sandwiches as they can watch the barges, yachts and cargo ships float by. If you are lucky you might even see a manatee. Address: 398 NW North River Drive, 305-375-0765.
Who cares if t his well-liked hang out is located in the Best Western? This North Bay Village chain is lucky to have one of the cities most popular waterfront Miami restaurants. Shuckers is all about cheap pitchers of beer, drink specials, greasy fried seafood and Rock and Roll on the stereo system. There’s a large, open deck for diners that’s great for nighttime or sunset lounging. Miami Beach restaurants guide makes this one of the best, affordable waterfront spots in South Florida. Address: 1819 79th Street Causeway, 305-866-1570. Most of the diners at Scotty's Landing arrive by boat or live in the marina and come to dine on fried seafood, fish dip and beer. Scotty's Landing has a large outside dining area set with picnic tables looks out over Biscayne Bay. Don’t get dressed up for this join or you’ll find yourself out of place amidst the flip flops and bathing suits. The Landing is behind Grove Key Marina, and may be hard to find, so call for directions if you're a first-timer. Address: 3381 Pan American Drive, 305-854-2626. Just off the Rickenbacker Causeway, this waterfront Miami restaurant is packed with sunburned boat people and other locals that stroll to Bayside Hut for cheap food. While it can't beat Shuckers' million-dollar view -- diners have to glance across the parking lot to see the water -- the Hut's breezy nonchalance reflects a sensibility that's more Key Largo than Key Biscayne. Outside diners should bring bug spray. For a cheap treat, try the Mahi wrap. Address: 3501 Rickenbacker Causeway, 305-361-0808.